How I first heard Azari and III is indicative of their sound, which can be best described as dance music cut into fine lines of disco synthesized euphoria, to be snorted in generous doses. At a downtown L.A. party, SummerTramp (where brown-meets-white meets all the colors of the rainbow in swimwear), a DJ played a song that I’d never heard. I had to add it to my iTunes library. While continuing to dance, I held up my smart phone, to capture the song and identify the artist. Ten seconds later, Hungry for the Power by Azari and III appeared on the music app. Everyone at the party went crazy. The experience was recreated, with more smoke and flashing lights, when the band came on at 12am, Saturday, November 10, as part of the Sónar On Tour Concert. The preceding band, Die Antwoord (who unabashedly dissed Mother Monster, Lady Gaga in their music video, Fatty Boom Boom) woke up the crowd, while Azari and III took the crowd on a rave binge at the Shrine Expo Center. The vocalists Cedric Gasiada (aka Starving Yet Full) and Fritz Helder ran on the stage and sung, “I’m hungry for the power,” and their movements matched the lyrics. 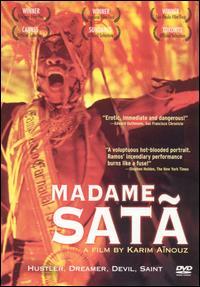 They were animalistic, dramatic, and nuanced; an effect that was appreciated. The worst thing that can happen going to a dance music concert, is watching an entertainer who cannot entertain. Everyone in front of me, in the standing room only space, who hadn’t been dancing to Die Antwoord, rocked out with the Cedric and Fritz. The other band members: Dinamo Azari and Alixander III were behind turntables, serving the crowd the classic house beats they needed to hear. Azari and III is an amalgamation of Dinamo’s last name and the three I’s after Alixander. The group’s goal is to create art and it was accomplished. They are a band with a future-sound and a fashion forward look. The wild intensity created by the energetic four-some, was extended and visualized through Pfadfinderei, an internationally renowned design collective. Dolphins, cut flowers, music video clips, and unrecognizable words flashed behind the band and were interrupted by rainbow-colored Emergency Broadcast System slides. The visuals served as a fifth band member, heightening the concert experience. Into the third song, Indigo, Cedric asked the crowd, “Are you possessed?” As I looked around the mob of people, I could tell everyone was literally possessed, dancing away, uninhibited. Whatever the source of that possession is open to question, but Azari and III’s music genius is not. Nine songs later the crowd was hungry for more. After leaving SummerTramp, I downloaded the song, Hungry for the Power, and realized I had more music from the band. I had their song, Stay Here, which was a super-collaboration with English dance band, Friendly Fires. I even had songs they remixed: Little Boots’ Shake, Sam Sparro’s I Wish I Never Met You, MNDR’s #1 in Heaven, Uffie’s Difficult, and Sunday Girl’s Self Control. The line up at the Sónar On Tour Concert also included: DJ Nic Fanciulli, DJ Paul Kalkbrenner, and DJ Seth Troxler. The concert attracted: college students, club kids, drag queens, musicians, L.A.’s fashion elite as well as Kat Von D, Dita Von Teese, and Rose McGowan. L.A. was the last leg in the tour schedule. Some concertgoers had not heard of Azari and III, but became instant fans. Azari is hungry for your love and your love they will have, one city, one song, one remix, at a time. To listen to Azari and III check out their YouTube Channel @ AzariandiiiOfficial and to buy their music go to iTunes now. 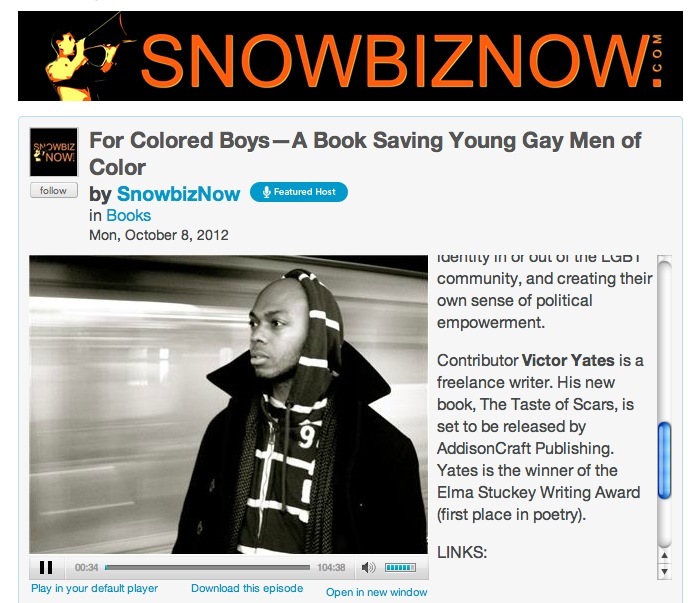 Nicholas Snow, of Snow Biz Now Radio, interviewed me on Monday about my writing and being in the highly acclaimed anthology, For Colored Boys, edited by Keith Boykin. Click HERE to listen to the show. SnowbizNow airs approximately three hours a day, five days a week, from 6:00 p.m. to 9:00 p.m. PST. The show explores and reports adventures in the world of travel and entertainment, along with current events, sexuality, politics, lifestyle, health, fitness, spirituality, personal empowerment, pop culture and more. African-American, Latino, and Asian-American writers tell their own stories of coming of age, coming out, and coming home. The new book, For Colored Boys, tells stories of real people coming of age, coming out, dealing with religion and spirituality, seeking love and relationships, finding their own identity in or out of the LGBT community, and creating their own sense of political empowerment. Contributor Victor Yates is a freelance writer. His new book, The Taste of Scars, is set to be released by AddisonCraft Publishing. Yates is the winner of the Elma Stuckey Writing Award (first place in poetry).